2Lt Lee C. Heil (CP) - Didn't fly on the Lehmann Crew's first two missions. Flew 31 missions as the Lehmann Crew CoPilot. Was upgraded from CoPilot to Pilot on 29 July 44 and flew his final two missions as a crew pilot (#217 on 3 Aug 44 and #221 on 6 Aug 44) completing his 33 mission combat tour. 1Lt Charles F. Miller (Bombardier) - Was hit by flak in the head and shoulders on his 22nd mission (#192 on 25 June 44) and was hospitalized. During the flight back to Molesworth first aid and care was supplied by 2Lt William J. Gast (Nav). Resumed combat missions on 8 Aug 44 and flew 11 additional missions with three different Pilots. Was KIA on 9 Sept 44 (Mission #238 to Ludwigshafen, Germany) on his 33rd and final combat mission (Pilot 1Lt John A. Newton - 7 KIA and 2 POW). The Lehmann Crew utilized substitute Bombardiers and Toggliers on their missions after 25 June 44. 2Lt William J. Gast (Nav) - Was on his 22nd Lehmann Crew combat mission when Lt Miller was wounded. Requested that he be removed from combat status following this 25 June 44 mission. Flew one additional mission (#198 on 7 July 44) for a total of 23 missions. Was then assigned to a non-flying ground position. The Lehmann Crew utilized substitute Navigators on their remaining 10 missions. S/Sgt James D. Kelley (Radio) - Was wounded on his left leg on his 22nd mission (#192 on 25 June 44) to Juvincourt, France and was hospitalized. The Lehmann Crew utilized substitute Radio Operators on 8 missions between 30 June 44 and 13 July 44. 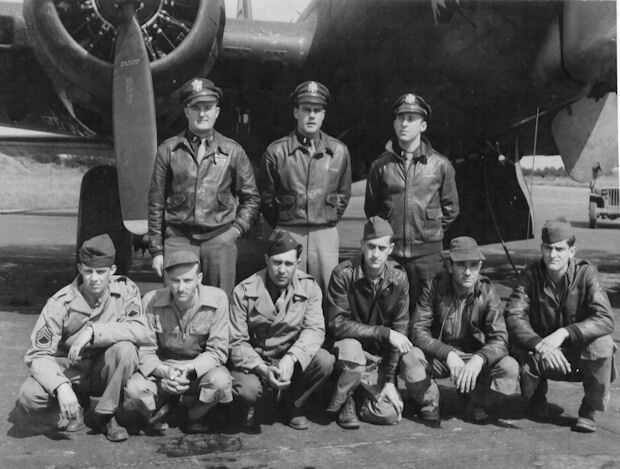 S/Sgt Kelley returned to combat duty and flew on the Lehmann Crew's final two missions (17 and 19 July 44) and the flew two additional missions (1 & 4 Aug 44) with other crews. Flew a total of 27 combat missions. Sgt Russell W. Baker (WG) - Flew his first seven missions with the Lehmann Crew. (#171 5 June 44 to #179 13 June 44). Substitute Waist Gunners were used by the Lehmann Crew between 27 May and 3 June 44 on the crews first 6 missions. Flew a mission on 6 June 44 with another Pilot. On 8 June 44 the crew size was changed from 10 to 9 men by eliminating one of the two Waist Gunner positions. Sgt Baker resumed flying with the Lehmann Crew on 30 June 44 flying his last 10 missions as a Waist or Tail Gunner. 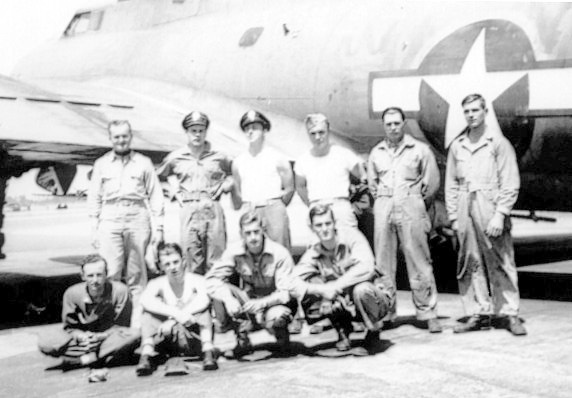 His final 18th mission was on 19 July 44 when Lt Lehmann completed his combat tour. S/Sgt Wayne L. Ruhge (TG) - Was Tail Gunner for the crews first 23 missions plus the crew's last two missions - Total of 25 missions with Lt Lehmann. After Lt Lehmann completed his combat tour S/Sgt Ruhge flew 6 additional missions with other pilots. His finished his final 31st mission on 21 Sept 44.